This week's show included songs by Def Leppard, Motorhead and Muse. Joe paid tribute to Lemmy from Motorhead who died on 28th December aged 70. He also mentioned the forthcoming released of the Down 'n' Outz live DVD which was filmed in December 2014. The full playlist is shown below along with a few of Joe's on air quotes. "Well as another year sails off into the sunset we welcome a brand new year. Goodbye 2015, nice knowing ya. And welcome 2016. What do we have in store?. Not really sure yet. It's a little early to tell. But let's go over tonight's show. Sixty minutes of some great stuff. I'm gonna try and highlight some of my favourite music from 2015 as well as some of the more significant moments of that year. Gonna start off with this crowd who made a fantastic return in 2015. This is The Darkness." "From what is my favourite album of last year. The album Drones. The band Muse and the song we just heard there Mercy." "From the latest Def Leppard album that is a song called Battle Of My Own." 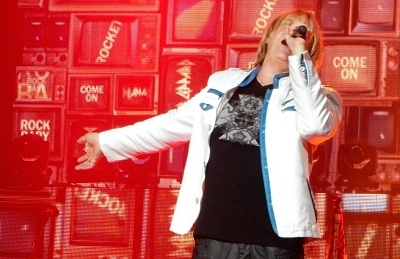 "Now this crowd apparently don't like Joe Elliott's Louder beer. I think it's because it's too strong for them at 11 proof. But they do make a good noise. This is the Biters." "They went down an absolute storm on the tour with Def Leppard and Whitesnake. The band are the Black Star Riders and that's from their latest album that came out earlier this year. The album The Killer Instinct and the song we just heard Soldierstown. And before that from the album Electric Blood. Their taste in beer may be suspect but their music is damn good. And the band are the Biters and the song we heard Restless Hearts." "And that my friends is about it for this week. It's always a pleasure to do this show. I wish you all a very, very happy 2016. I may have only just scratched the surface with what is everybody's favourite music or certain people that have passed away that are no longer with us. I just can't get it all in in sixty minutes." "But I am gonna finish with this. Which I think is a very poignant way to end the show. Having seen U2 perform a couple of times on their current tour. They walk out on stage to this song and I think it very fitting that when they invited The Eagles Of Death Metal to join them on stage in Paris after the Bataclan tragedy. They performed this song together. They chose love over fear and I think that is a fantastic thing that we should all remember. Until next week I'm gonna leave you with this. This is Patti Smith from the album Dream Of Life with the People Have The Power. Happy new year everyone."